​For many years students of German in Coláiste Bríde have been hosting students from our partner school, Gymnasium Bruckmühl in southern Bavaria. 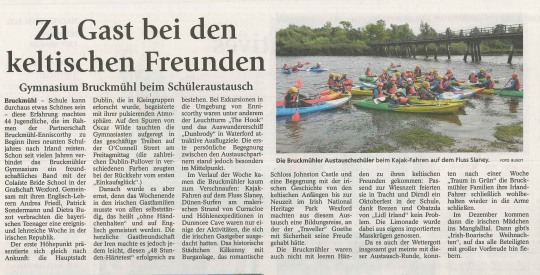 ​This year the group of 43 German students and 3 accompanying teachers enjoyed a varied programme which included sightseeing in Dublin city centre, kayaking on the River Slaney and sand surfing in Curracloe. Also included in the itinerary for the week were a trip to Kilkenny which included a guided tour of the Dunmore Caves, a visit to the National Heritage Park and Johnstown Castle, bowling and cinema and an Irish Night, provided by Celtic Roots. Departure day was marked on both side by lots of warm hugs and tears as the new German friends left for a trip to Glendalough on their way back to Dublin airport. During the group’s stay in Enniscorthy, Coláiste Bríde’s First Years were treated to traditional Bavarian dance display andKapellenmusik (traditional Oktoberfest music), Bretzel and Spezi at the “Moktoberfest” celebration where the friendly German students, dressed in traditional costume, chatted with them and served Bretzeln (freshly baked pretzels) and Spezi (a fizzy drink). The German leg of the exchange programme takes place at the start of December and the Coláiste Bríde girls are already looking forward to seeing their German friends again, experiencing family life in a German home, learning all about German Christmas traditions, attending lessons at Gymnasium Bruckmühl and exploring the cities of Munich and Salzburg. Below is a newspaper article from the Mangfallbote (a local newspaper in Bruckmuhl), a glowing account of the Germans' experience here.